Information on the role of extreme leftists in promoting hatred of Jews and denial of the Holocaust. Extreme left-wing movements have often vilified Jews as capitalist exploiters. Many of the founders of socialism peddled hatred of Jews. Detailed study of extreme left-wing antisemitism. The origins of Marxist antisemitism. How the Trotskyist movement became antisemitic. The ideological convergence of far-left anti-capitalists and far-right antisemites. Why extreme left-wing anti-Zionists are in the vanguard of antisemitic boycott campaigns. How anti-Zionist Jews promote antisemitism, often quite deliberately. Soviet antisemitic campaigns during the Cold War. Russia’s communists are still fomenting hatred of Jews in the post-Soviet era. Excellent analysis of extreme left-wing incitement against Jews in Britain. Campus far-leftists, who once banned Jewish student groups, now silence protests against their own bigotry. Radical leftist intellectuals have played a crucial part in making antisemitism respectable in Britain. The British far left’s scandalous promotion of an ex-Israeli antisemite. British far leftists tried and failed to unite with Islamic extremists on the basis of shared hatred for Americans and Jews. Antisemitic diatribes in a journal issued by a respected academic publisher. The election of a far-leftist who consorts with bigots to lead Britain’s Labour Party. Extreme left-wing activists in Germany demand the destruction of Israel and blame Jews for global capitalism. Austrian socialists promote a Nazi fanatic. Radical leftist politicians in Spain vilify Jews. Australian campus ultra-leftists are so blatantly antisemitic that their Muslim allies are embarrassed by them. Documenting antisemitism on American ultra-leftist sites. Antisemitic McCarthyism in a Canadian ultra-leftist magazine. Report on the notorious diatribe by militant priest Daniel Berrigan. The antisemitic rhetoric of radical icon William Sloane Coffin. Deplores left-wing indifference to Gore Vidal’s infamous essay in The Nation. How a founder of Germany’s Red Army Faction turned into a prominent Nazi. Ralph Nader warns that the Israeli “puppeteer” controls the White House and Congress. What is Going on in the Scottish Palestine Solidarity Campaign? British ultra-leftists cite neo-Nazis and Holocaust deniers, blame “international Jewry” for the “hydra-headed monster” of Zionism, equate Judaism with Nazism and justify the murder of Jewish teenagers. The shocking record of former London Mayor Ken Livingstone and his antisemitic Trotskyist allies. The sordid record of the cult leader’s involvement with Jew-hatred. 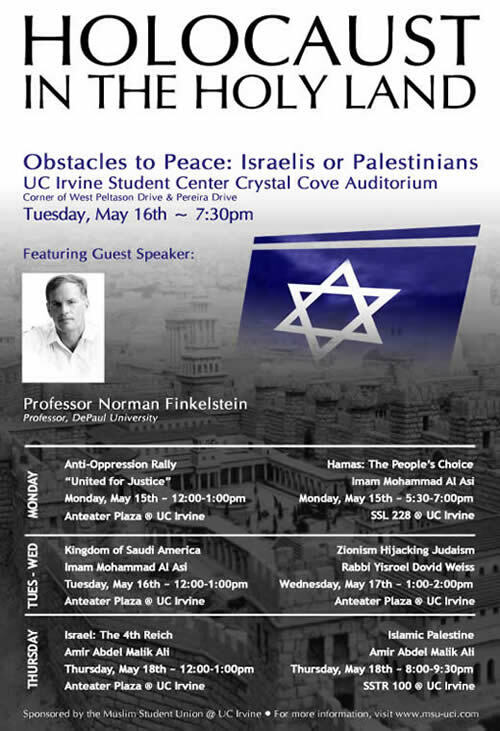 Noam Chomsky’s disciple Norman G. Finkelstein dismisses the Holocaust as an extortion racket against Germany, says that Jews run America, compares Israelis with Nazis, justifies al-Qaeda, champions Hezbollah, speaks alongside Hamas supporters and gives interviews to Holocaust deniers. Philosopher Michael Neumann admits to encouraging vicious antisemitism and the destruction of Israel. Sixties veteran Jeffrey Blankfort blames Zionism for the Holocaust and describes the existence of Israel as a “cancer” that threatens the future of the planet. The British magazine Return, edited by Uri Davis, Tony Greenstein and Roland Rance, equated Zionism and Judaism with Nazism. Jewish students and national student leaders condemned it as antisemitic. Paul Bogdanor, Is Mark Elf a Paranoid Antisemite? Britain’s Jewish antisemites are now accusing each other of lying and bigotry. Abraham Melzer, a publisher who sought funding from the PLO, and Hajo Meyer, an Auschwitz survivor who belittles the importance of the Holocaust, are Jewish antisemites according to the German courts. The fascist background of Israel’s most notorious PLO apologist. Jonathan Rosenblum, An Israel Prize For Wagner? The murderous rhetoric of Yigal Tumarkin and his comrades. Werner Cohn, Shahak: The Jews Are Bad! The Blood Libels of Israel’s worst antisemite. Neve Gordon defended the killers of Jewish children and then resorted to a Holocaust-denying judge to silence his critic Steven Plaut. Yehiam Sorek offers his support to discredited Blood Libel historian Ariel Toaff. French socialist Paul Rassinier was one of the first Holocaust deniers. The far-left outfit La Vieille Taupe – led by Pierre Guillaume and Serge Thion – became a major source of Holocaust denial propaganda. The Nation is caught running an ad for Holocaust deniers. Kamm exposes a Holocaust denier at Z Magazine. CounterPunch has promoted and defended Holocaust deniers. Holocaust denial by 9/11 conspiracy theorist Jane Christensen. Anti-Zionist Miriam Reik posts material supporting Holocaust deniers on an extreme leftist Israeli discussion list. Oregon campus ultra-leftists commemorate an infamous Nazi pogrom by hosting an infamous Nazi apologist. How Zionists saved tens of thousands of Jews from the Nazis. Zionist rescue demands during the Holocaust. Zionist attempts to save the Jews of Hungary. The communist propaganda campaign blaming Zionists for the Holocaust. Inevitably, the propaganda campaign inspired antisemites everywhere. Former Yugoslav intellectual Slavoj Zizek has attempted to revive the conspiracy myth. A sane Marxist points out that the conspiracy myth is itself reminiscent of Nazi antisemitic propaganda. American Trotskyist Lenni Brenner is the foremost Western exponent of the myth of the Zionist-Nazi conspiracy. This essay documents his manipulation of facts and sources, as well as his antisemitism. Rejoinders to Tony Greenstein's hopeless defences of Lenni Brenner against the charges made in my paper. See below for more on Greenstein. Paul Bogdanor, Who is Lenni Brenner? More on Lenni Brenner’s antisemitic activism. More on Brenner’s factual distortions. British Trotskyist Jim Allen promoted the conspiracy myth in his virulently antisemitic play Perdition. Tony Greenstein spreads falsehoods about Zionism and the Holocaust while praising antisemites and Nazi apologists. The British far-left politician and former Mayor of London has peddled numerous “collaboration” fictions of his own. Anti-Zionist filmmaker Eyal Sivan produced a thoroughly misleading documentary on the Eichmann trial. The extreme left’s Blood Libels about “Zionist-Nazi collaboration,” “the Holocaust industry,” etc. Richard Breitman, A Nazi Crusade? The ideological fictions of historian Arno Mayer, who pretended that the Holocaust was an unplanned result of the invasion of the Soviet Union and that most of the victims died from “natural” causes. Anti-Zionist Shraga Elam sends a friendly message to Holocaust denier David Irving in which he denies Hitler’s responsibility for Auschwitz. Then he debates the subject with his fellow Israel-haters. Other far-left pseudo-scholars who publish falsehoods about the Holocaust.